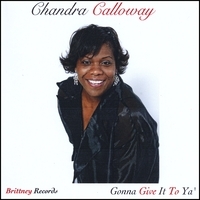 Chandra Calloway began singing at the early age of 6 years old at the house parties of her parents, Joe Lee & Ruby Jean Calloway in a small shotgun house in Grand Prairie, TX. Her favorite song was \'The Clean-up Woman\' by Betty Wright. She would put on her mother\'s blouse (which appeared to be a dress) and feather cap and grab the kitchen broom. And, when the room was quiet… she would make her appearance! She had a love for singing, even then. Chandra has been on a southern soul tour, for over five years, as a back-up singer for blues artist Mel Waiters. And, she is currently working on her first major, and much anticipated project. She is busy writing and creating new \'girlfriend flava\'. With songs like ‘She Was Gonna Give it to Ya’, and ‘Look who’s Jody Now!’, Chandra is destined to set the radio airwaves on fire. Singing professionally, for over 16 years, she has shared the stage with actor/comedian Steve Harvey, Erykah Badu, Ollie Woodson (of Temptations fame), Michael Bolton and even Barry Manilow, just to name a few. She began writing at 10 years old and discovered that her gifted poetry kept turning into repetitive lyrics. At 21 years of age, she began acting training at the Studios at Los Colinas, a major film studio in the Dallas-Fort Worth area, and performing in local bands. She got a taste of the blues when she joined her mother on a valentines\' weekend. The Late Buddy Ace put the microphone to her mouth and she belted, \"It don\'t hurt no more!\" And, the crowd loved it. Chandra learned how to bring the soul out of her lyrics that night. R&B/Soul music became her new best friend. Wherever there was a contest or an open ‘mic’, Chandra was there. She has always believed that everyone should be appreciated for their individual style and message. In 1998, she found a perfect venue to express all of her creative talents. Reciprocity was an open ‘mic’ hot spot in Dallas, TX that offered much more than just a microphone. Chandra performed in various Dallas & Fort Worth night spots, while working at Steve Harvey\'s Comedy Club. Her most favored professional accomplishment is being on the cover of the eighth issue \'The Grand Prairie Black News\', her home town publication. And, one of her major goals to make her hometown proud!